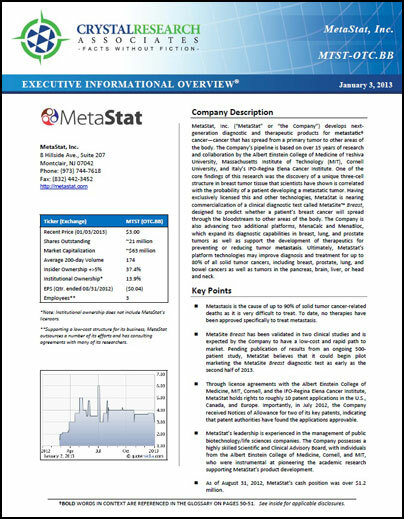 MetaStat, Inc. (“MetaStat” or “the Company”) is a life sciences company commercializing a new approach to reliably determine a patient’s individual risk of developing systemic metastatic cancer and then to help reduce this risk through active intervention of the metastatic process. The Company’s technology is based on a proprietary knowledge of the mechanisms that govern “metastasis” (the spread of cancer away from its primary site in the body). The technology centers on the role of the Mena protein in tumors, and has over 15 years of study from major medical institutions. MetaStat is initially advancing two diagnostic platforms targeting breast, prostate, lung, and colorectal cancers, which could enter the market as early as 2015, as well as a therapeutic program. The Company believes that its function-based diagnostics can lead to better treatment decisions by identifying patients with a high risk of systemic metastasis who require aggressive therapy and sparing patients with a low risk of metastasis from painful and costly therapies. The National Institutes of Health (NIH) recently concluded that a primary goal in cancer research should be to accurately define patient risk categories with the goal of being able to administer the level of treatment needed for a successful outcome. 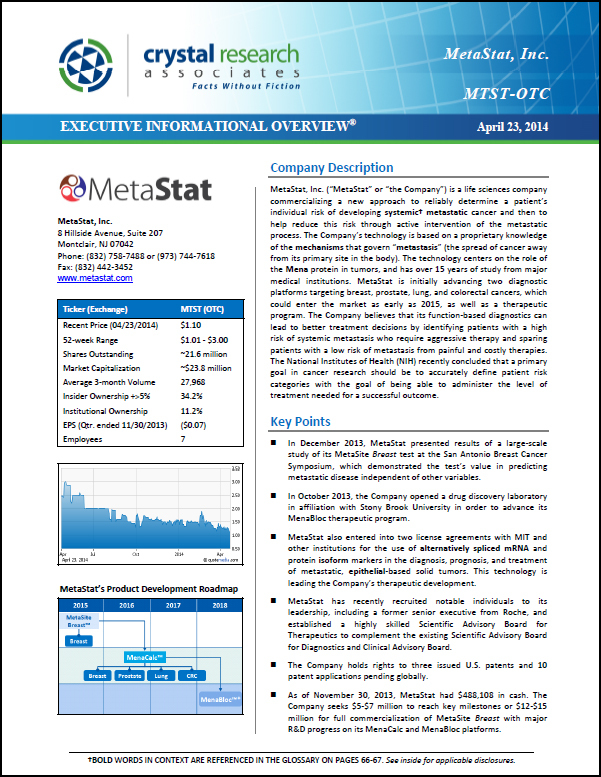 * The Corporate Snapshot was last updated on April 23, 2014.